Several events have already taken place, but the main programme of activities starts tomorrow – 20 April, the 25th anniversary of the opening of the Expo - when an official ceremony will take place in the presence of King Juan Carlos. Encapsulating the memories of thousands of volunteers and millions of visitors, the Expo 92 Commemorative Exhibition will be inaugurated tomorrow in the Pavilion of Navigation and will remain open until 12 October, the closing date of the Expo. With the title “Un exito de todos. Del sueño a la realidad” (“A success for all. From dream to reality”), the exhibition will trace the story of the Expo, from King Juan Carlos’ 1976 declaration of Spain’s intention to host a World Expo, through to the event itself, and its physical and cultural legacy. Many of the objects on display at the exhibition have been collected following a public appeal asking those who visited or took part in the Expo to provide photographs, memories, souvenirs and other objects to make the exhibition as inclusive as possible. Other activities that hark back to the transformative event include a photographic exhibition being held on Avenida de la Constitución, and a special exhibit of Expo posters in the Ateneo, planned for May. A large gathering of Expo staff and volunteers is also being organised in June, giving all those who lived and breathed the Expo a chance to reunite and recall fond memories, 25 years later. Encouraging citizens to rediscover the diversity of international participation at the Expo, Asociación Legado Expo Sevilla will organise guided tours of some of the 32 pavilions that are still standing today. Several of these pavilions have since adopted new roles entirely – the Moroccan pavilion houses the Three Cultures of the Mediterranean Foundation, France’s pavilion is host to a start-up incubator, and Italy’s large pavilion now serves as offices to tech companies. On a cultural note, Seville’s Book Fair (18-28 May) will include round table discussions on the Expo’s cultural activities, which included the popular “Gold of America” exhibition, an array of opera and orchestral performances, and night-time entertainment running until 4am. Even children, born many years after Expo 1992, will have a chance to discover the spirit of the Expo at a special parade to celebrate the birthday of Curro, the famed mascot of the Expo. A song to be released tomorrow, dedicated to the mascot and the spirit of the Expo, “Curro, 25” has been specially written and recorded for the Expo’s 25th anniversary. 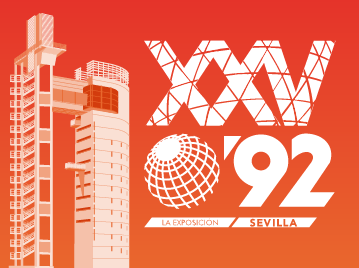 While the various activities commemorating the Expo will bring back fond memories, the city of Seville and organisers of the 25th anniversary celebrations aim to focus on the Expo’s continued legacy and future opportunities. Located adjacent to the Expo site next to the Torre Sevilla, a new park – The Magellan Gardens – was opened in early April. When unveiling the programme of events, Mayor Juan Espada emphasised the importance of continuing to develop the Cartuja Science and Technology Park (PTC Cartuja), which he described as a major part of the city’s business card. The Bureau International des Expositions (BIE) is the intergovernmental organisation in charge of overseeing and regulating World Expos, Specialised Expos, Horticultural Expos and the Triennale di Milano.